‘If you can’t agree on the problem, chances are you won’t agree on the solution.’ I heard or read or came across this thought somewhere years ago and it came to mind during one of our recent residential landscape projects. The owners, two design-savvy and visually oriented individuals, approached McKinnon Associates with the goal to resolve questions, concerns and differences of opinion in the redesign of their home’s outdoor spaces. Both of the owners are long-time gardeners; and both, skilled in various building crafts, wanted to participate in the design and implementation of the project. I should add that they are also detail oriented, which is a perfect fit for my design philosophy. The home itself was charming, designed in the Arts and Crafts bungalow style, well crafted and beautifully maintained. A stately oak tree dominated the house, which is located on the corner of a busy, inner-city street. With that saying ringing in my ears, the first order of business was discussion: define the problems so we can design the solutions. 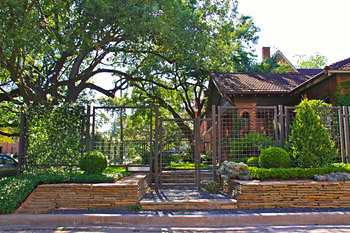 Immediately, we recognized several areas that needed to be addressed, such as, the approach to the front door; the beautiful, though overwhelming, oak tree; planting challenges under the oaks; and integration of the existing elements, which included a koi pond and a stone terrace in the backyard. As well as controlling the physical aspects, the clients also had specific wishes that needed to be woven into the design. The owners were in agreement that they wanted outdoor spaces that would lure them, and guests, into the garden. Being design oriented, they were keenly aware of site lines and wanted a very deliberate and precisely calculated plan. And, of course, we knew we needed to respect the home’s Arts and Crafts architecture. Photographer: Gaile Porter. The final design was the result of intense consideration of every single detail. We ultimately decided that a fence was warranted, and we chose a design that carefully considered height and retained a sense of openness to make it welcoming to guests and neighbors. We enhanced existing design features. We expanded plant palettes. We changed the way visitors approach the house, relocating access to one side and adding a multi-level terrace. Taking inspiration from the house’s brick detailing, we designed and installed a metal arch to define a dining area. We worked together, discussed and tested every detail. Even the actual installation was a collaboration with McKinnon Associate crews handling the heavy construction, materials and plantings, and the owners executing many of the fine details. I hope you will take a minute to enjoy our collaborative effort. I think you’ll find there is something very engaging and very right about the design. And, the next time you – or your builder or architect – have a problem that needs help resolving, please call. We would love to work with you to find the solution.